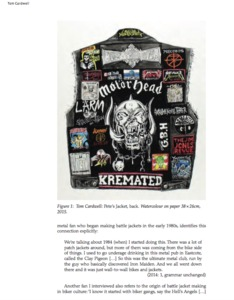 This article will consider the significance and meaning of battle jackets within the context of metal subcultures. Beginning with a summary of the history of the practice of customizing jackets by metal fans, ideas of personal subcultural identity and authenticity will then be used to more fully understand the importance of the jackets to those who make and wear them. 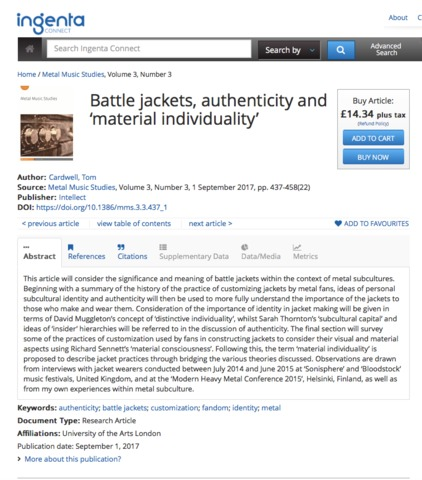 Consideration of the importance of identity in jacket making will be given in terms of David Muggleton’s concept of ‘distinctive individuality’, whilst Sarah Thornton’s ‘subcultural capital’ and ideas of ‘insider’ hierarchies will be referred to in the discussion of authenticity. 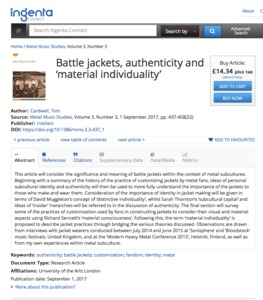 The final section will survey some of the practices of customization used by fans in constructing jackets to consider their visual and material aspects using Richard Sennett’s ‘material consciousness’. Following this, the term ‘material individuality’ is proposed to describe jacket practices through bridging the various theories discussed. Observations are drawn from interviews with jacket wearers conducted between July 2014 and June 2015 at ‘Sonisphere’ and ‘Bloodstock’ music festivals, United Kingdom, and at the ‘Modern Heavy Metal Conference 2015’, Helsinki, Finland, as well as from my own experiences within metal subculture.